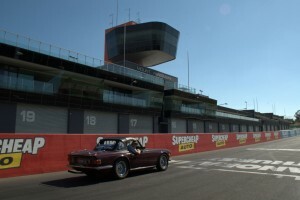 This is your opportunity to test your observation skills against other teams in their Triumphs for the coveted All Triumph Rally Trophy and the opportunity to set next year’s test. Meet in the Feathers Hotel Carpark, Greenhill Road, Burnside from 8.30 am for a 9.00 am departure. 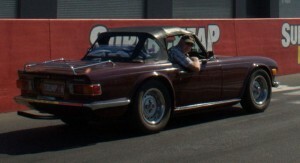 To be eligible to win the trophy you must be driving a Triumph. If you can’t bring your Triumph for some reason, come along and participate anyway – it is a fun event! There will be a club sponsored BBQ at the destination. BYO clipboard, pen, chairs, table, drinks etc. Congratulations must go to Duane for this month’s run. We were joined by the usual crowd with 3 saloons and 2 Tr6s. It would have been nice to see a few more in the convoy though. The run did start off at a VERY slow pace but that was to make sure that we stayed in line and no one got lost. The run took us through some great roads that we have not ventured down much, if not at all. I did think that getting over 40 Klms per hour was going to be a challenge, but as we hit the hills and winding roads the engine and shocks got a work out. Not only did we get a good turnout but Duane was able to pull off what can be one of the best presentations held by a local business that we have seen. Damian from “Paracombe Premium Perry” (Pear farm for the uneducated) was very inviting well versed on his produce and just very open to our group. Yes it was cold but as we arrived they took coffee orders from all that wanted warm hands and Mark the local Barista delivered a very nice cuppa. 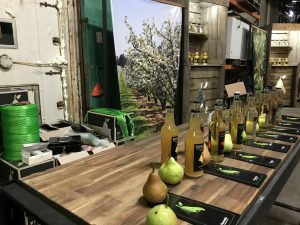 Damian presented us with a very informative tour of what they produced, how it all started and the finer details of preserving, caring for and delivering a range of produce from what I thought was a very simple fruit. It was interesting to see how Damian has continued to run the family business. Moving back home in 2010 he took over from his father and moved to modernise the output with some overseas machines and also turned his skill in inventing line processes that not only work well but out shine off the shelf machinery. The site started in 1932 by his grandfather and it has stood the test of time. Handed down through generations and is now managed and run by Damian and his wife Amelia. They were also helped on the day by Pam who was just as welcoming. 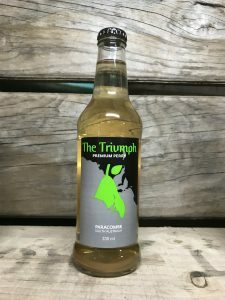 The Triumph line of cider started back in the 1800s and after sampling all of the alcoholic and plain juices we were given a clear sample to try that you could run your car on. After 2 hours of conversation Coffee and question and answers we said our thankyous purchased some pears and bottled produce and farewelled our hosts. We were back in the cars and after a short trip up the road met at the Cudlee Creek hotel for a $10 roast lunch. I think the day went very well and after we all said good bye for the day Raelene and I went on a bit further to the Cudlee Café for a final Coffee and met up with Wilhelm Galler and his wife. Last year’s winner of the annual “All Triumph Observation Run” that is to be held on Sunday 15th October. No secrets were handed over just that this year’s run is in the final stages. I hope to see as many Triumphs out on that day all challenging for the winner’s trophy. It’s always great to meet up on the monthly runs and for me is a way to forget work, dust off the Triumph and just enjoy life with friendly people. Thanks again to Duane and I’m looking forward to the next run. Although off to a nervous start i did manage to get all Triumphs in convoy today for a quick run through the northeast and Range Road. Naturally(?) Our Triumphs left the modern cars behind and the rain stayed away for a fun and informative tour of Paracombe Premium Perry farm. Its on again and time to start thinking about polishing and dressing up those Triumphs. This year we will be at Semaphore just by the public area south of the Steam Train Kiosk. Entry will be opposite Coppin street and parking on the grassed area for Triumph Owners. I will need several volunteer judges again and I’m look forward to working with them to pick the best of the best. We will also be looking for those with pride in their cars and as usual Pride of ownership will be Judged. Local traders are there for food and drink so No coffee bus will be on site. You can bring a SMALL shade tent as this year allocation around the outer areas has been included in our display. This year we have invited the Cadillac LaSalle Club of SA just for an added interest. There are some fine examples of these in SA and it will interesting to see what turns up on the day. Cadillac was Founded – August 22 in 1902 and has a rich history. Cadillac is among the oldest automobile brands in the world, second in America only to fellow GM marque Buick. The firm was founded from the remnants of the Henry Ford Motor Company in 1902 and named after Antoine de la Mothe Cadillac. The founder of Detroit Michigan. So build a car and a town why not. Cadillac was also the first American car to win the Royal Automobile Club of the United Kingdom’s Dewar trophy. This award is for Interchangeability of components just like Triumph. With the Standard Car Companies purchase of Triumph in 1944 the development of the Triumph 1800 was a solution to keeping the Marque afloat, they began exporting to the US and with the 1800 styling, 3 abreast seating, column gear change and folding dickie seat it was a good fit. Almost the length of Cadillac its features were suited to the American market and renamed the 2000 Roadster after an engine change. After that the rest is history and the models kept coming. Utilizing Jag engines swapped out chassis remake styling and the list goes on. With the Standard Car Companies roots starting not long after Cadillac in 1903 the merging of components and bodies the link is thin but there. That’s how I see it anyway. So with all that history of different models, astute men with drive to succeed in a competitive market and global success how can we not display that to the public? So it’s worth getting them out from under the covers and onto the road. This year on SUNDAY the 12 November drive to Semaphore. Starting time is as usual around 8.30. Cars need to be in position for judging no later than 10am when judging starts and the cut off for entry. It’s a pity that during the last 12 months some of the clubs breeds have moved on especially Chuck and Dianne’s black beauty. As it won’t be there this year to take the front row I’m sure we will have a worthy contender. This will be decided on the day so if it takes my eye when you roll in then decision made. Let’s hope the weather is kind and we get a good turnout. The Breakfast Run on 23rd April organised by Ian Rigby ended in Lyndoch with 15 members cooking breakfast in the Lyndoch Recreation Park. The weather was perfect and the Lyndoch Craft Fair was on, which a few people went to after breakfast. Thanks to Ian for organising. The mid week on 3rd May is being organised by Graham Jones and meeting at Joan’s Pantry in Hawthorndene at 10.00am for coffee before setting off for a run through the Hills ending up at the Inglewood Hotel for lunch. The weekender is getting nearer and Margie & Bill have again put together a very good value package for us all. This year the weekender is heading to Meningie and Kingston. We will be stopping for two nights in Meningie with activities organised for each day. We are sure all those who attend will have a full weekend of action and friendship. These weekenders take a lot of organising and Margie & Bill certainly had added frustration with the breakdown of their car when doing all the routing over Easter. David Stephens is organising a run on 18th June meeting at 10.30 for an 11.00am departure at the Unley Shopping Centre Carpark Unley Road Unley. The run is heading to Tanunda and the Tanunda Hotel for lunch. Contact David for more details. See advert in TRak. Christmas in July themed lunch for just $15.90 a head including dessert. See advert in TRak. There are still a few vacant spots on the Supper Roster so if you are able to help, please contact either Margie, Sue or Peggy and put your name down. Thanks to those people who have already volunteered. for a hearty Christmas Roast with all the trimmings. Only $15.90 per head including dessert. If you would like to get into the Christmas spirit, you could decorate yourself and your car with Christmas trim. Wow what crazy weather we are having….hot, cold, wet and who knows what’s coming next! Thanks to everyone who has put their name on the supper roster…we still have some vacancies…if you can help out please let Sue or myself know. Thanks to Phyllis Rutter who did supper last meeting. Great to have you on board! We have cut the sweet money down, as the members don’t seem to be eating the sweets as much, so we can reassess this in winter. Bill and I have been working on the Weekender, and it has all come to plan, including sailing on Lake Albert for those who want to take up the challenge! The Coorong is a fascinating place to visit, but there are a lot of miles to travel, so I hope the petrol is not a ridiculous price that weekend. Condolences to Kevin Foster on the loss of his mother. Possibility for members to join in Friday night at a reduced rate – Children’s Rates –by negotiation. Weekend includes . . .